January 2015. I was in Varanasi (Banares). Mr. Nagarajan and family invited me and my people for breakfast at their house near the ghats. While visiting them, Mr. Nagarajan gifted me a book, written and autographed by Avadhoota Nadananda. I had never heard that name before. In my journeys of Himalayas, alone and with people, I have met and sometimes got acquainted with many saints of various capacities. But, the picture of Swami Nadananda attracted my attention. I asked Mr.Nagarajan about him. He said that this Swamiji was living in Jammu, and then in Andhra Pradesh and keeps shifting his base as per the need of the time. I asked him how I could meet him as I was feeling a deep urge to see him. 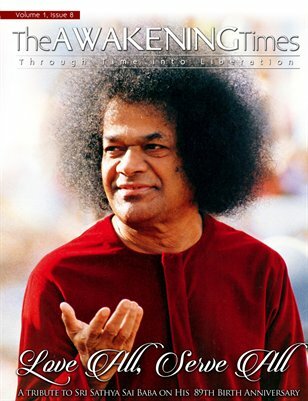 When I opened the book, there was a mobile phone number and Mr.Nagarajan told me to contact Swamiji on that number. I agreed. Later I travelled back to my abode in Dharamsala and due to excessive travels, writing, visitors and programs, I could not contact Swamiji. One day, after a few weeks of overseas travels, when I returned to Dharamsala and entered my room, the book of Nadananda came in front of my eyes. I took the book, opened it and tried the number in the book. It was switched off. I tried that number various days, various times. I could not reach him. I had no clue why I was trying to meet this saint. I knew nothing about him except that he hailed from Kerala, my home state too. But, that was not the reason for sure. Something else was pulling me to him. I did not know and it was not so important either. Almost a year was past, numerous travels and programs later, finally I returned back to India. This time, due to some reason, I spoke to Mr. Nagarajan and I casually told him that I could never get in touch with Avadhoota Nadananda. He told me that he would revert. Later, he called me and gave me another number and said that Nadananda is in Andhra Pradesh and I can speak to him. I called him and finally I got him on phone. The conversation was formal and not so deep. I told him I would like to meet him. He said he would be at Dhar in Madhya Pradesh and I am welcome. Now that we are on touch through mobile phones, a meeting was definitely possible. Soon, I had to travel to places like Pune, Shirdi, Bangalore etc, and in between I feel sick too. Suddenly from Pune, since we had some time, we decided to go to Dhar. I called up Nadananda. He welcomed me. But he confused me with another Mohanji and was a bit reluctant to accommodate me because apparently, this other Mohanji is a saint with many demands and protocols while I do not have any such things. The confusion was cleared and 5 of us set out to meet Nadananda in Dhar. It was like homecoming in a way. He was so warm and friendly and spontaneous. His face oozed love and recognition. He is deeply connected to Mother Goddess and also to his Guru Tara Mayee Ma of Mookambika who lived in the forest of Kollur as a perfect Avadhoota. Avadhootas are saints who never even care about their body. They lead a life of complete abandon. They eat food if they get it. Even if they get food, they may distribute it to the hungry birds or animals instead of them eating it and through their satisfaction, derive satisfaction and completion for themselves. They dare heat and cold. They are always immersed in divine consciousness and act only as per divine will. There will be no action based on karmic compulsion as they have dissolved their karmic bindings before they become avadhootas. They are usually aloof and not easy to recognise as great masters because they walk around in rags and torn clothes like mad people or beggars. Some of them do not take bath for days on, yet will have no stench at all and on the contrary; many of them will have a sacred fragrance around them despite their seeming unclean lifestyle. They usually display erratic behaviour which confuses ordinary people and drive away those who are systematic and terrestrial oriented. They never utter a vain word. Their word becomes command to the nature. They choose who can be connected to them. They drive away the unwanted and the not-so eligible wandering or unstable seekers. Their words always come true. Their words can cut across karma and change the lives of people. Those who harm them get doomed in their own action. They are powerful beyond comparisons. Their words come as command to the universe. Not even Gods interfere in their commands. Avadhootas wander in this world and we hardly recognise them or usually ignore them as mad people or ordinary beggars. They keep it this way to filter the eligible from the sundry. Avadhoota Nadananda is a slight exception. He lives in a house and he orchestrates service activities. He has taken seva as his means of communication with this world. He lives to serve. He lives a humble life and takes up large seva activities as per the need of the location. He initiates people in practices too. But, one could always see the underlying detachment. He himself cooks food for the poor. He washes dishes along with others. He orchestrates havans and homas. He leads the show but he remains totally aloof from everything. The next day after our arrival was Datta Jayanti (Birthday of Lord Dattatreya). He asked us to stay back and participate in Datta Jayanti celebrations. He had arranged a simple accommodation for all of us next to a granary. We participated in the morning havans, including the poorna ahuthi. It was an energy filled experience. The day’s program was filled with dance and music. Accomplished musicians came and sang with devotion in the temple. Earlier, Nadananda chanted with immense power and bhaav despite his physical state. He even made me dance with him. He displayed extra ordinary love towards all of us. In the middle of the day, suddenly, as if by divine command, he organised a get together and honoured me with a shawl and gifted me a Sri Yantra. He introduced me to the crowd and also spoke about the projects that we would be associated. The next day early morning, we were leaving back to Pune, after stopping at Shirdi to meet Swami Ganeshananda Giri at the hospital where he was being treated. So, we bid good bye to Avadhoota Nadananda in the evening and promised to call him once we reach Pune. It was like bidding good bye to our own father or grandfather. These words penetrated and lodged firmly into me like an arrow piercing and settling into the bulls eye. An Avadhoota never talks in vain. He really meant what he said. This is a huge assurance for an adventurer like me who do not follow much of the set norms and prefer to be experiential than acquired knowledge oriented. This trip was most definitely for initiating this connection. When a master who has dissolved all his identities say “I”, this means the whole lineage of avadhootas of Gyan Ganj where he belongs to and the Goddess as well as Lord Datta who they honour and worship are with me. I knew that I will realise it and experience their presence in my life more and more in the days ahead. Mila hugged him and kissed him. It was a kind of homecoming even for little Mila. I told my wife Devi: "Imagine Mila meeting so many masters at her tiny young age! Did we ever have such opportunity at her age? If we had, where would we be today in the realms of awareness!" Mila merged with the local crowd so effortlessly without even a trace of uncertainty even though she knew not even a word of Hindi and the local people spoke no English either. Children are spontaneous and totally adaptable. Language is no barrier for them. Another Avadhoota – my past experience with a true avadhoota was at Vrindavan, the land of Lord Krishna in 2014. Processed food is indeed useless not only for a raw avadhoota, but even to the seeming sophisticated ignorant masses as well. I fed the biscuits that I had to the dogs, cow and a single monkey who gave him company instead. When you feed the hungry birds and animals, an avadhoota is satisfied; his hunger is quenched. Later, last year, I suddenly felt a deep urge to see him and went searching for him in Vrindavan (Uttar Pradesh). After a lot of difficulty, we found the location. He was not there. The shop keeper told us that he is no more. He had left his body a few months ago. The shop keeper also said that even though he lived his life as a beggar or stayed at the road side, when he died; his devotees came in Mercedes and BMWs and took his body for burial. All of them were surprised as to how many people turned out for the function. He said easily it would be around 200,000 people! This is the power of a real master, a real magnet, a real being irrespective of how he lived or how he presented himself. Pure Gold always shines, even if it lies in the mud and it never gets contaminated by anything around it. One rain can regain its splendour as before. Avadhoota Nadananda had arranged to send all his books to my parents address at Palakkad, which I had given earlier. When I reached home, I had a feast of books by Nadananda. My hands directly went to his autobiography. The two volumes of truth! Avadhoota Nadananda. The Man. The Vulnerability. The Tenacity. The Determination. The Grace. The purpose. The Miseries. The Masters. The autobiography is filled with truth as true as daylight and as Nadananda experienced it. He never attempts to conceal his vulnerability in this wide world of opportunistic people who come to a master to take worldly possessions and often not to shed the baggage of karma and evolve into higher realms of awareness. He was betrayed by many people whom he trusted and loved. He was cheated by those who got a new lease of life because of him. He took on pains and illness of others and often suffered prolonged illness. He saved people from death and some of them after healing disowned him completely. People took away his money or did not keep their promise towards payments. He has been abused in various ways. But, the masters of Gyan Ganj and his Guru Tara Mayee moved him, guided him and made sure that he survived for the sake of the tradition of Avadhootas. It is always the case. The body belongs to the tradition. When the mind is surrendered 100% to the tradition, all that happens to the body, mind or intellect, only happens to the tradition and not to the person or personality. The autobiography oozes honesty. No greater than thou attitude at all. Humility is the key ingredient of any established saints. You could see it aplenty in his work. Complete and total humility and no eagerness to prove anything! Most of his journeys and experiences that he narrates through his book will be unfathomable to most people. Some of them could be unimaginable and perhaps unthinkable too. Destiny automatically configures encounters which take every karmic man to his destination through time, even without him being aware of it. And more often than not, the life of a true master can never be contained within one life time. One lifetime would just be a referral point – the point of beginning of an epic which would run through generations. One lifetime will only serve as a point of recognition or establishment of personality. More often than not, their contemporaries may not understand or recognize the fire of spirituality behind the seeming erratic personality of an avadhoota. The generations to come will understand because they have no person or personality to deal with. They only have the message of the master to fathom. Some will drink the message in raw form and attain higher states of awareness while some will use it to earn terrestrial accolades. A true master’s presence, his mission and his teachings will usually survive his physical absence. Avadhoota Nadananda took the plunge into the relatively anonymous world of pure spirituality beyond all comfort zones and emotions that an average human being can ever imagine. Most people do not even know what they are searching for; let alone where they are searching or even where they are going to. Remember, this has nothing to do with the religions or religious guidelines that the regular societies are used to. True spirituality is beyond all religions. It is beyond the mind, intellect and body. It is directly linked to the spirit, the only permanent factor in our constitution. Spirit enlivens us and helps this otherwise dead body to walk, talk and see the world. In this journey, personal identifications may develop pride and possessiveness. It may develop egocentric ownerships. Wisdom comes in handy sooner or later, to identify and understand what, where and why this journey as well as how to attain liberation. By shedding consciously whatever is not ours, and by detaching from whatever seemingly ours is - meanwhile rooting firmly in dharma of existence, a yogi walks the narrow path to liberation. Avadhoota Nadananda walked without money, without shelter, even without any clear destination as a parivrachaka (a wandering monk). He physically saw Goddess Mookambika and through her found his Guru Tara Mayee. He surrendered completely to his Guru and Guru elevated his awareness and established him completely and firmly in the path of Avadhootas. Guru Tara Mayee told him not to beg for food. If food arrives on its own through sundry hands, he could accept it. If food does not come to him, he should observe spontaneous fasting. Never seek luxury and comforts and never succumb to any habits. Life should be larger purpose based beyond any personal preferences or pleasures. Nadananda walked through the often treacherous terrains of the known and tangible through the unknown to the unknowable. The promise of his Guru that “I shall be with you and shall provide you what you need at the appropriate time” was the lifeline for Nadananda during such journeys. Lots of people walked in. Some stayed, and some left leaving behind a pool of problems for him to handle and sort out. Some cheated while some offered a helping hand during unexpected twists in life. Thus, just like any terrestrial being, Nadananda encountered much hurdles during his walk of life. ACCEPTANCE is the fundamental in the journey. One has to accept life as it comes. Accolades, abuses, heat and cold moments of existence, love and hate as well as every flavours of life must be accepted as it happens, as it is delivered. Never ask WHY? Never seek anything – yet follow Guru’s instruction to the core. Whenever frustrations dwell in the mind, remember the guru’s words and without thoughts or question obey it. Guru has no agenda. Guru is a road sign and if the disciple follows the road sign completely, he will reach his destination. The journey could be tough or the terrains could be fearsome or dangerous, but it must be tread to reach the destination; since the Guru knows that the disciple is in the right track, there should be no worries. The Guru always takes care. The Guru always cares. Unconditional acceptance helps the disciple and the journey. Guru stays as an umbrella of protection throughout the journey. Guru’s protection came in many forms when Nadananda most needed it. He stayed away from the snares and lures of terrestrial existence and kept walking the tough terrains of Himalayas encountering destiny head on each and every time. The answer is quite simple. What is the intensity of our yearning? What is our level of practice, application, surrender and dedication to the cause of liberation? Are we ready to walk that extra mile beyond our usual comfort zones? Are we really serious about our spiritual evolution until complete dissolution truly happens? Food for thoughts! It is worth thinking. Most of us are essentially comfort oriented spiritualists. We will only do things well within our comfort zones. We set boundaries for practices. We set targets and expectations which eventually lead to disappointments. Boundaries always restrict our elevation, evolution and eligibility for dissolution. When we truly break our boundaries, we cease to exist as a personality or even a person. We become fluid and flexible. We become the river as well as the flow. The river will eventually nourish many. Powerful masters acquired all their powers because they were unbound by any boundaries. They were free. Being free is a state. And where are we gaining our freedom from? Our limiting mind! Not easy. The cold Himalayan terrains! The unpredictability! No protection and no comforts! Faith is the only possession. Trust in Guru is the fire of warmth. Everything else is non-existent. This was the trail of Nadananda. He walked days on, hungry, thirsty and often fighting the looming exhaustion, in search of the truth. Many times he fell down, silently, without any complaints he got up and continued walking. There was nothing to complain and nobody to listen. It was always an individual journey taken for a larger cause, much larger than human mind can perceive. The eternal truth of what he will be, shone forth in the horizons of his consciousness. He knew he will reach there. The weakness was only in the body. Mind was firm with faith. Conviction was unshakeable. Guru’s grace walked with him as unseen hands of kindness. Her presence came in the form of food and water from the unexpected. Grace sheltered him in times of extreme weather conditions. Guidance did happen when needed most. Inner guidance provoked by the inner-net communication by the Guru. The most reliable inner-net connection between a Guru and disciple! Never conditional! Always existing on a wonder element of surprise in the mental level! The beauty of the Guru – Disciple relationship as we often see in the terrains of India is unfathomable and beyond comparisons. This is perhaps the highest of relationships ever and ever will be. But, in the commercial world of high expectations where everything is transactional, we hardly see this beautiful bond of a true Guru with a true disciple. Guru guides the avadhoota - Keep Walking. Do not accept favours. Favours will spoil you. Take only what is essential for that time. No more. Do not store or hoard. Have faith that each time hunger happens, grace will bring food. If not, walk on as a day of fasting was essential in between. Various places, various terrains of Himalayas! Various kinds of people – Good, Bad, Kind, Deceitful, opportunists, cunning - every sorts of human specimens came and went. Some stayed. Some manifested and dissolved with time never to appear again. This is the story of the Avadhoota. It also takes us through the treacherous paths of market places where an innocent, naive avadhoota becomes an easy soft target. It takes us through the existence of super natural in day light. Mother Mookambika Devi, the Goddess herself manifests to the true saint to guide him to his Guru. The wandering disembodied soul of a woman who lost track after a tragic road accident finding soothing energy in the company of the saint who is brimming with the energy and vibration of mantras. The seeming ignorable people, who eventually prove to be supremely powerful, and provides invaluable insights into the secrets of existence,. Himalayas means mystery, if we have eyes to witness it. The existence of Gyan Gunj, the abode of great masters, which is also called Shambala or Shangrila in Tibet. This terrain is totally inaccessible to every level of seekers except the pure and complete. This is an unseen terrain which even inner call or guidance cannot take you. The only criterion is eligibility to be there. And this is no ordinary eligibility; the person who could enter there should have the subtlety to be one among them, a total renunciate who have nothing to do with anything in the world. Avadhoota Nadananda went there against all odds, with great difficulty, after tons of tests and tribulations and got initiated. He is the 48th pontiff of Gyan Gunj – as he himself told me. This mysterious land is not tread by saints, let alone people. To the eyes of the ineligible, the terrain itself is invisible. It needs an extreme amount of integration into the subtle aspects of our existence to develop eyes to witness Gyan Gunj. The rest is grace. Welcome to the journey of a lifetime, the story of an avadhoota. The exceptional story of a living master, Avadhoota Nadananda. Thank you ..thank you ..thank you . It is a feast to senses to read thru this article. It is merely the grace Avadhootha come and spend time amidst us. How powerful is the statement even the Gods do not interfere in their commands. Thanks a ton for this article. Thank You Beloved Mohanji. for this Sacred Love offering to Beloved Avadhoota Nadananda and the Regal Masters of Gyan Ganj. What an immense privilege to immerse on the energies of Purity Beauty and Love. Dear Anupam, we sent you private message to your email. Please check it, LOVE! This article came like a light totally unexpected in darkness. I ( oh no I am nothing) seek further progress in my spiritual journey. Would be indebted to you forever if some mode of communication withshri Guru dev is provided to me. Sarve mangalamayam. Dear Vishwanath, we sent private message to your email. Please check it, LOVE! Thanks for your kind response . will include you in my prayer to devi mata. Loka samasta sunumber no bhavantu. my mobile number is 9480655500. Kindly whatsapp incase you feel like contacting me. Could you please kindly provide me with contact number of Avadhoota Nadananda and where he currently lives in India.. I would be really grateful..
Dear Sudeep, we sent private message to your email. Please check it, LOVE! I wish to meet Avadhoota Nadananda Ji. Would be eternally grateful if his contact details can be provided. I like to meet swarmi ji. Hi, can you please send Avadootha Nandanandaji’s number please. Would be extremely grateful. Such a beautiful article about Avadhoota Nadanandaji. Thank you for introducing us to the great saint. I would love to have his Darshan if mother so wants. I would be grateful if you could provide me his contact number. Can we meet Nadanandaji, please guide. Could you please share the name of the Avadhoot whom Mohanji used to meet in Vrindavan and photo if available….